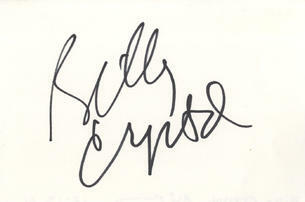 This is an In Person Signed White Card 6" x 4" by the American comedy actor. William Edward "Billy" Crystal (born March 14, 1948) is an American actor, writer, producer, comedian and film director. He gained prominence in the 1970s for playing Jodie Dallas on the ABC sitcom Soap and became a Hollywood film star during the late 1980s and 1990s, appearing in the critical and box office successes When Harry Met Sally... and City Slickers. Additionally, he has hosted the Academy Awards eight times.